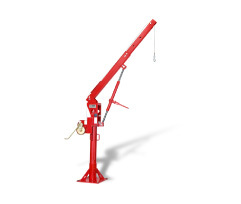 Stationary Cranes - Thern Davit Cranes - Made in USA | Thern, Inc.
No matter what your lift and hoisting needs are, Thern has you covered with superior lifting equipment. We manufacture a wide variety of stationary cranes that make your work easier, more efficient, and safe. Browse Thern stationary cranes below! Thern’s line of stationary cranes allow for extended-length booms for maximum reach on larger loads and are capable of lifts up to 1,500 lbs (680 kg). With electric, hydraulic or pneumatic operation, the Captain 1500 rotates 360 degrees and has a quick-disconnect anchor. Thern’s line of stationary cranes allow for extended-length booms for maximum reach on larger loads and are capable of lifts up to 2,200 lbs (997 kg). The Captain 2200 model can be a hand or power winch operation. The hand winch operated models include spur gear or worm gear hand winch with brake for load control. Power winch operated models include 115 volt 1 phase AC electric winch with pendant control and brake. Other power options are available as well. The Captain 2200 can have a fixed boom or an adjustable boom option, and the mast and boom rotate on tapered roller bearings for smooth 360-degree load movement. Thern’s Admiral line of stationary cranes is transportable using two people and feature a fully adjustable boom for handling large loads with maximum flexibility with capacity ratings up to 3,000 lbs (1360 kg). The Admiral 3000 model can be a hand or power winch operation. The crane rotates 360 degrees on a tapered roller and needle bearings an locks in 12 positions. A handle on the mast provides for easy rotation. The adjustable boom telescopes to five different lengths to adjust the height and reach. A boom brace comes standard and holds the boom in a fixed position during operation. An adjustable boom angle option allows for 50 degrees of movement with hand-operated ratchet style screw-jack.